Financial Assistance available for Overnight Camp. Early bird discount is now available for Overnight Camp. 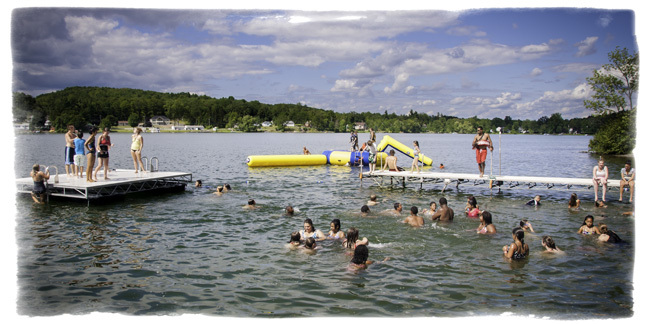 Register and pay in full by February 28th and receive $20 off per camper per week. June 30 - July 5 - Week 1, TEEN WEEK ONLY. July 7 - July 12 - Week 2, Harry Potter. July 14 - July 19 - Week 3, Star Wars. July 21 - July 26 - Week 4, Around the World. July 28 - Aug 2 - Week 5, Color Wars. Aug 4 - Aug 9 - Week 6, Super Heroes. Aug 11 - Aug 16 - Week 7, Disney Week. Drop off and pick up information can be found here. Campers wake at 7 AM and engage in activities until bedtime. The day's activities are split into three sections. During the day the ten campers and two staff, (a 1:5 supervision ratio), participate in a variety of structured scheduled activities. These activities include swimming, fort-building, sports, crafts, archery, team building, arts, canoeing, kayaking, cooking, challenge course, and field games. Our famous Gaga pit is now scheduled out and every cabin gets a chance to play this crazy game many times during the week. The group will also spend some time on the beach and in the water together. Archery is one of the most popular activities at Camp Scully. If your camper wants to learn to swim - we will teach them. We have had huge success teaching hundreds of campers to swim over the years and we are very proud of that achievement. Kayaking is a tough skill to learn; we'll teach it at Camp Scully. At certain times during the week the entire camp comes together for some special activities: Theme Week activities, Predator Prey, Carnivals, Radio Scully and the ever-popular Beach Party. Our varied Evening Program introduces campers to the forest and stars at night, entertains them at campfire and skit-night, and provides the famous Scully Dance. The week is rounded off with our Candlelight Ceremony. Everyone goes swimming in the afternoon. All meals are cooked on site and conform to USDA guidelines. Every child will receive 3 meals a day and a healthy snack. Please look at our menu for specifics, we stick as closely as possible to that menu each week, however occasionally, the menu changes due to supplier issues or unexpected circumstances. Camp also has a camp store with snack items to purchase. $2 may be provided to campers who qualify for financial assistance. Still Unsure About Overnight Camp? If you are brand new to Camp and are wondering if it is a good idea, watch this video by Peg Smith, CEO of the American Camp Association. Unique and special activities sometimes ONLY happen at camp. Check out this spontaneous song that got created one year. 2010 Camp Scully Song from Camp Scully on Vimeo.